10. The Beano | Things I Wasted Too Much Time On. As a parent you understand it is the little things that make your kids childhood. We’ll actually it is the little cheap things that keep your kids as quiet for the longest time and stop them bugging you for the more expensive things. 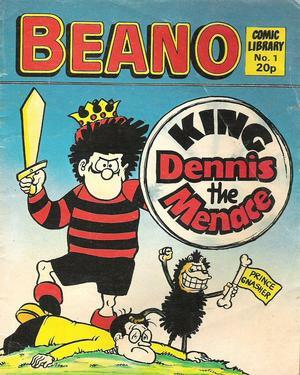 Each week I would have The Beano bought for me. 6p ( 12 cents) in those days equaled a good two or three hours of quiet time for the parents. Each week I would read the antics of Dennis the Menace who I’m sure wouldn’t get away today with what he did back in the 1970s. Dennis would probably now been on some kind of medicine for ADHD. He would cause more problems than any rioting crowd in London, he would beat up on Walter the Softy and I would laugh. Thinking about it the whole comic back then was full of kids getting away with no good. Dennis the Menace, Minnie the Minx, Roger the Dodger, The Bash St. Kids all terrors and walking disaster areas. And I loved every edition. I think it appealed to the inner-anarchist that hides very deep inside. 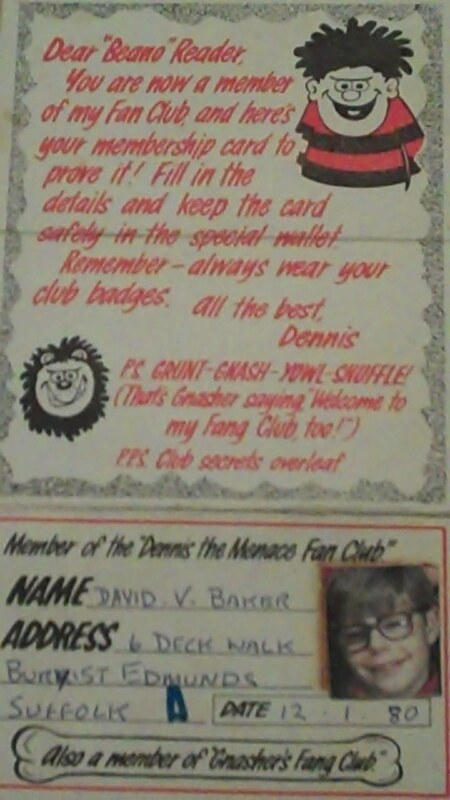 I am still a proud member of the Dennis the Menace fan club. One of the very few items I kept when I moved from Bury St.Edmunds to Detroit. You got a wallet that contained the club rules and two badges, sweet. 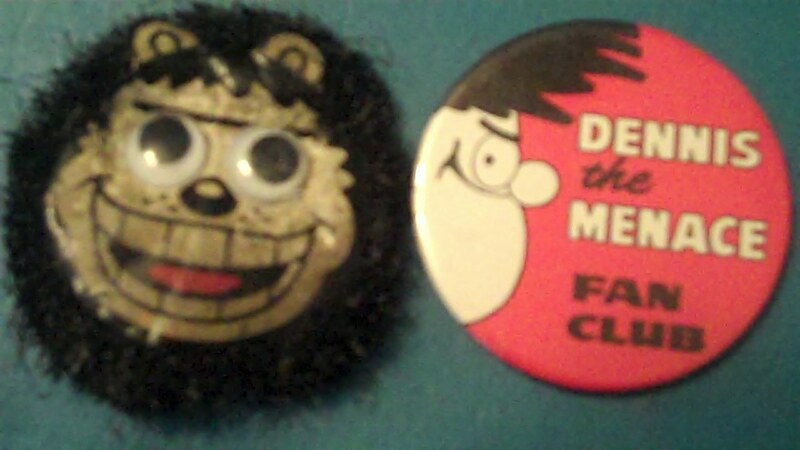 There are even ways to wear the badges that mean things, you’d have to join the club to find out, I am sworn to secrecy! The chances of me meeting another member here in Detroit are slim I know, but D.I.N.G. anyway! I always read the Beano, hated Desperate Dan and the Dandy and Whizzer and Chips. 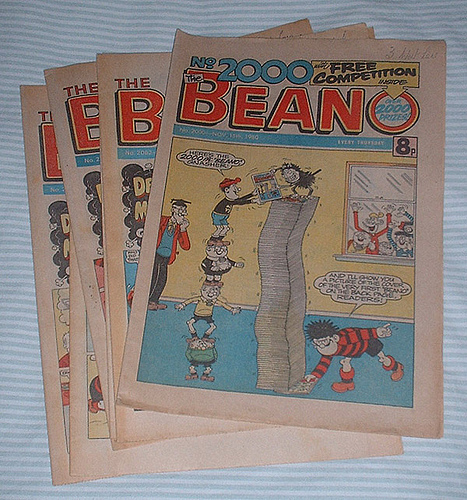 I was a Beano-a-holic, I especially loved the free gift editions, my favorite being the Dennis and Gnasher glove puppets. I got really excited when the 2000th issue came out. Now Christmas comes but once a year, but a Beano annual lasts forever! Each year I would get at least two or three of the same book from relatives. I must have been easy to buy for! 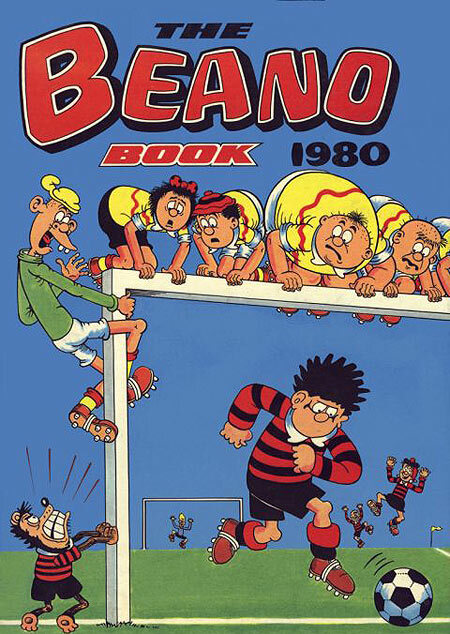 The book always had longer stories of my favorite characters, something I always liked which was why I was so glad that in 1982 the Beano Comic Libraries started. I collected around Two-hundred of these fun sized books. Each one about 80 pages of action with one character. I still have all these back in England in a box in my Mothers shed gathering dust if anyone wants to buy them! Including the very first edition and the very rare editions 9 and 10 of which only a few were printed due to a strike at the printers at the time! Every now and then I wish I could be more like Dennis, that inner disaster area stays well hidden. My rebellion level will have to stay low-key. Like sticking monkey nuts in weird places. After you post on word press it gives you a little message about your post, how many words etc. It also gives you a random word of encouragement to carry on blogging. I thought the word it gave me for this post was a weird coincidence. 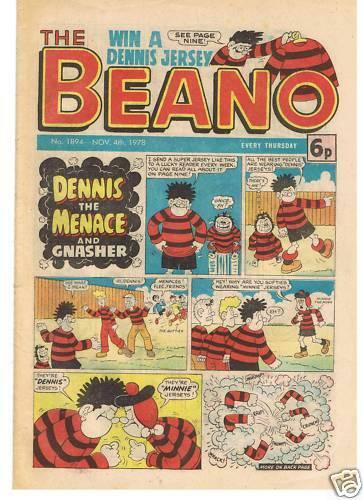 This entry was posted in collections, Comics and tagged 2000th issue, ADHD, bash st. kids, beano, bury st.edmunds, comics, dandy, dennis the menace, detroit, edition, fan club, Milwaukee, minnie the minx, roger the dodger. Bookmark the permalink. Pingback: 75. Knowing Me, Knowing you! | Things I Wasted Too Much Time On.